Some of the redirections are from organized alternative funds, others come from groups of individuals who pool their resisted war taxes each year and then decide collectively on grants. Along with the group redirections, we know that individual war tax resisters around the country make their own redirection choice. We’ll make note of these when individuals send them in. 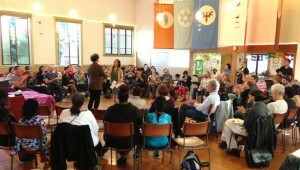 Northern California People’s Life Fund granting ceremony. Photo by Susan Quinlan. Berkeley Copwatch, Berkeley Student Food Collective, California Coalition for Women Prisoners, Community United Against Violence, East Bay Covenant Sanctuary (RCSP), East Bay Meditation Center, Ecumenical Peace Institute, Freedom Archives, Hand to Hand Kajukenbo, Longfellow Middle School, Mass Bass Music, Northridge Coop Community Garden, One Fam, Planting Justice, Prison Activist Resource Center, South Hayward Parish, TGI Justice Project, Urban Peace Movement, Western Institute for Social Research, Youth Spirit Artworks, Youth Together, plus a gratefully accepted donation to NWTRCC. Hi, my name is Mary Regan, and I have been a war tax resister since 1983, when I decided that I could not in good conscience participate in killing and destruction funded with our tax dollars. I pay about half of my federal taxes because about half of the US discretionary budget goes to pay for past, current or future killing and war. New England War Tax Resistance, a group of Boston area people who refuse to pay some or all of their federal income taxes in order to oppose the funding for wars, weapons, and killing, is proud to announce the donation of $4,500 to local organizations working for a more just and peaceful society. This donation, money not paid to the federal government, is redirected to efforts that are seen by our members as a better use of our common fund than the military budget. The Prison Birth Project, which works with mothers and trans parents currently and formerly incarcerated in women’s jails to increase access to reproductive choice and care in jail. In 2014, the women of PBP successfully lobbied to end the use of shackles on women in labor in Massachusetts. Now they are working to ensure this law is enforced and that women are allowed to pump breast milk for their children. The Massachusetts Alliance Against Predatory Lending to support its Bring the Wealth Home campaign to reverse foreclosure and restore as much as possible of the $12 Billion in foreclosure pillaged from communities of color. Association of Haitian Women in Boston to support an organizer to work with members on Comprehensive immigration policy in the US, and on human rights violations of Haitians in the Dominican Republic. The City School to build bridges across differences and mentor young people to become life-long community leaders for social justice. Contact New England War Tax Resistance at (617) 282-3783. 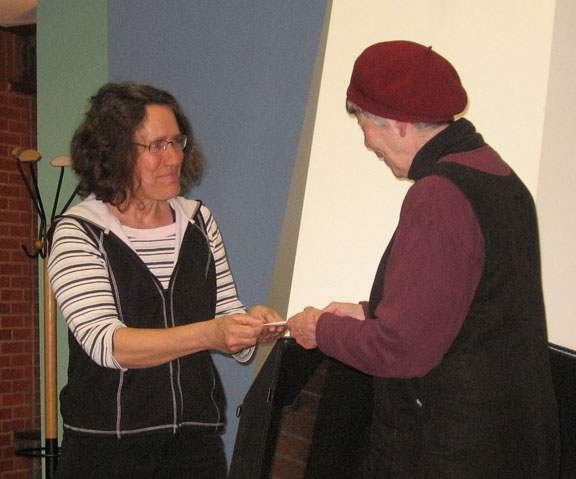 Pam Allee, right, presents a check of redirected tax dollars to Becky Luening of the Vietnam Friendship Village. To celebrate tax day in Portland, we had our annual Redirection program on Monday, April 13, at the Augustana Lutheran Church. Members of the group pool together their resisted taxes each year and jointly decide on the groups receiving grants. We “re-routed” thousands of dollars to 5 different groups including St. Lukes Veteran’s Bridge Fund, which helps returning vets get on their feet financially (something the federal government fails to do). Overall, another successful tax day, raising awareness of where our tax dollars go, and re-routing some of that money! Peg Morton talking with the media on tax day. Photo by Jain Elliott. 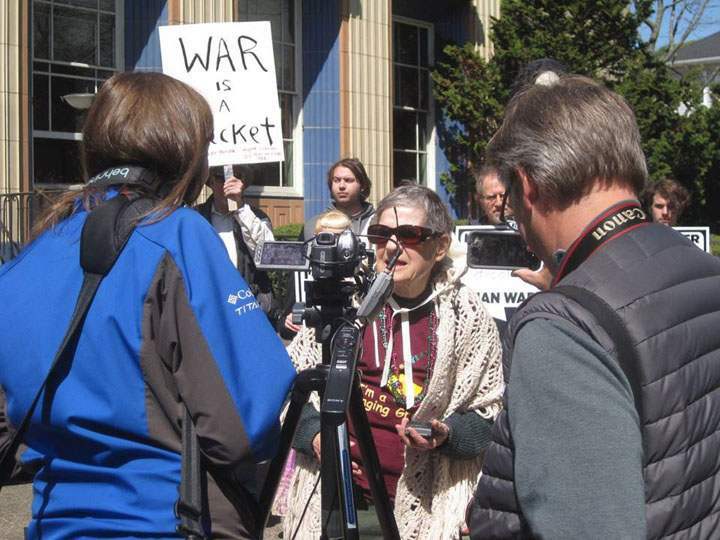 A tax day rally included presentations of redirected taxes, written as personal checks, to about 25 groups, many of whom came to receive them. Wellsprings Friends School was one of the recipients, and a group of students attended the rally. One student sang a solo about homelessness. We donated a total of $2092.50 this year. The above statement from the group is included with each grant. More photos from their tax day action are on our reports page. Conscience and Military Tax Campaign Escrow Fund, Asheville, N.C.
Click here for a list of alternative funds.